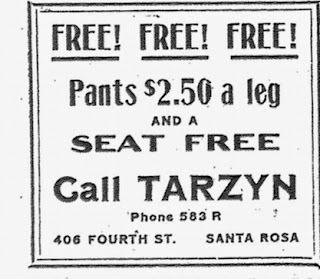 Let's go hunting for the "peculiar" items in the 1910 Santa Rosa newspapers - the offbeat or odd or just damned strange. This time the theme is mostly advertising; Gentle Reader might also want to check out "Did'ja Hear About..." which covers other odd news stories for the year and "The Peculiar is What is Missed Most," which is the roundup of similar articles from 1909. Before getting to the funny stuff, some housekeeping is necessary, as this is the final entry for the year 1910. By this time the Comstocks were well settled in to Santa Rosa, as described in a separate item. Also covered previously was the death of Maria S. Solomon, the mother of Mattie Oates, whose demise three weeks into January must have cast a shadow over their fine house on Mendocino avenue. Hints also appeared in the society columns that Mattie's health was beginning to fail. In April she and Wyatt spent a month in Southern California, where they made auto trips with close friends Mrs. Dorothy Farmer and her daughter Hazel. On their return the Press Democrat gossip columnist remarked "she is well and strong again." The new year had started cheerfully for the Oates; on New Years' Eve, he served as master of ceremonies at a large card party at the Saturday Afternoon Club. There he handed out prizes for events such as the "gentlemen's noise contest," where undertaker W. B. Ward's drum won out over a state assemblyman's cow bell and the former mayor's bread pan. Other than that, it was another quiet year for the semi-retired lawyer (he was 60, she was 52). They also spent a week at the ranch of friends near Duncan's Mills and as was their custom, hosted an extended visit by an ingenue of marriageable age, this time the niece of famed judge Amos P. Catlin. Their other houseguests were the Farnhams, a San Francisco couple often mentioned in the city papers. Mrs. Farnham was a prominent clubwoman and Dr. Daniel C. Farnham was an osteopath and a leader in the "National League for Medical Freedom" - a special interest group set up to fight the creation of a national public health bureau on the claims that it would hamper "individual rights." As this was completely out of step with the Progressive Era they were widely condemned as tools of the patent medicine makers, who funded their prolific amount of advertising. Whether or not the Oates' agreed with these aims is unknown, but the connection with the Farnhams could have been long-standing; at a 1911 rally, Dr. Farnham was introduced by Barclay Henley, Oates' first law partner in Santa Rosa. 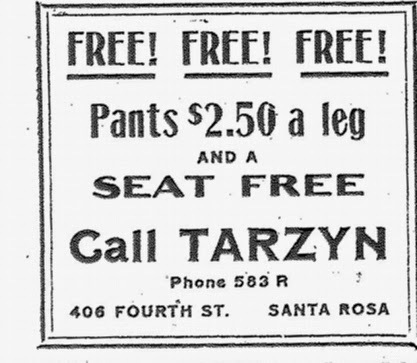 Our first 1910 peculiarity is the clever ad above for Joseph Tarzyn, a Russian-born tailor whose shop was at 406 Fourth street. (And no, his name had nothing to do with the popular Tarzan character, whose first story would not appear until 1912.) 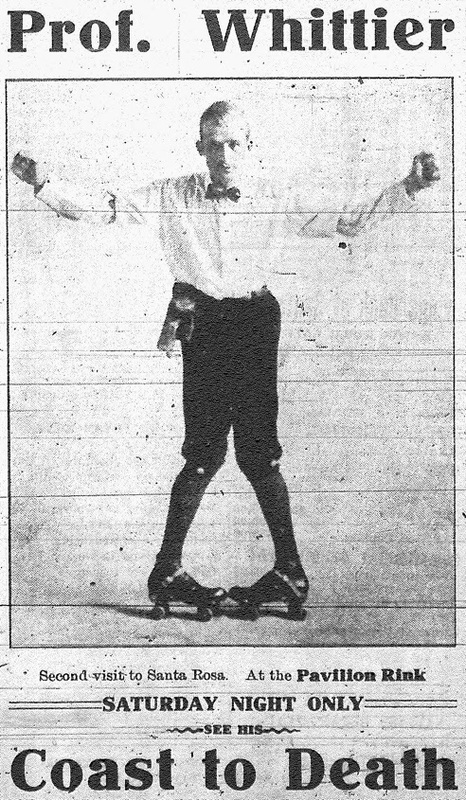 To the right is another advertisement for Professor Whittier, exhibition roller skater; we met the good professor earlier in another bizarre photo where he seemed to be staring down a row of mismatched kitchen chairs. 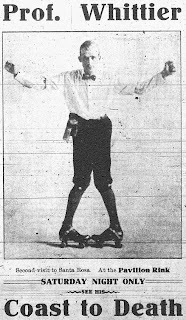 His "coast to death" involved jumping through fire and here he exhibits "clubfoot skating," which was surely every bit as offensive as it sounds. Out at Bodega Bay there was another type of jumping and awkward movement reported as Mrs. John Turner, fed up with being cussed out by her neighbor, pulled out a gun and began making him dance in the manner familiar to anyone who has watched a Yosemite Sam cartoon. "He at first demurred," the Press Democrat dryly noted, "but when the gun was brought into play he changed his mind, and as one shot followed another, he danced faster and faster, until finally a bullet hit him in the hip which ended the dance." The cusser was not seriously injured; the cussee discussed the matter with a judge a few days later and was released on parole. Alas, the papers did not report what happened in the case (as far as I can tell) but it's likely she only paid the customary fine of $5 for each shot fired; gun violence was not viewed with special concern - recall the 1907 shootout where a member of the Carrillo family did not spend a day in jail after shooting a man in the chest, yet his wife was behind bars for 30 days for public drunkenness in the same incident. And anyway, profane and vulgar language in the presence of a virtuous woman or child was considered as serious as physical assault, so the court may well have viewed Mrs. Turner's "dance music" as a kind of self defense. Handguns were also routinely carried and handled without modern concerns about safety - accidents of men shooting themselves through a pants pocket or coat were so frequent I stopped keeping track. 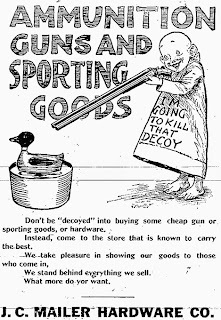 That many people were routinely packing heat may or may not seem unusual today (depending upon your politics) but the ad below certainly falls into the peculiar pile. The "Yellow Kid," an impoverished but cheerful waif, was the best known and best loved cartoon character of the day; using his image to sell firearms is a bit like Colt or Remington licensing the image of cowboy Woody from Toy Story to endorse real shootin' irons. That us folks of the Epwurth Leeg of the Methodist church, South, air goin to hav in the Leeg rume. If you kant finde it kum tu the church on Fifth an Orchurd streets. 1. A kompetant cor of menergers an aids will be in attendunce. 2. The hull sassiety wil interduce strangers an luk after bashful fellers. 3. Fun wil begin tu kommance at 8 o'clock. 4. Tu git into the rum yu wil hav to pay tin sents; tu git enything tu eat yo wil hav tu pay 5 sents. Kum at Kandle lightin' an stay until bedtime. No obstreprus er bad boys permitted. 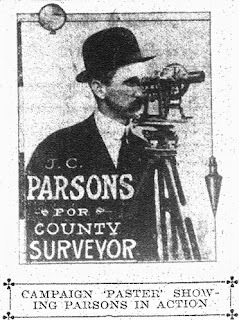 But the most peculiar ads of all that year were the campaign ads for a man running for County Surveyor, the sort of political job that usually draws hardly any attention at all. 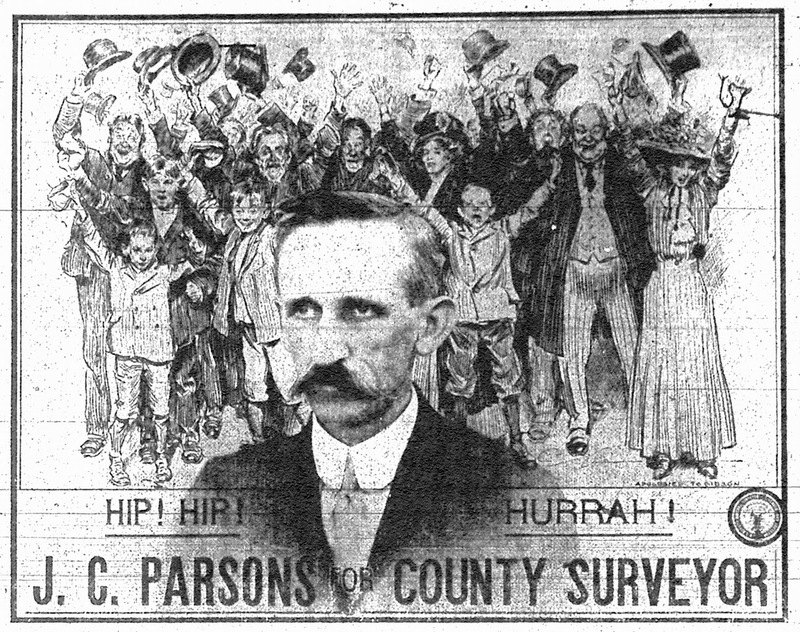 The fellow apparently covered the town with so many little posters it became a newsworthy item for the Press Democrat: "A unique little 'paster' is being used by J. C. Parsons, the Democratic nominee for County Surveyor, to further his campaign. It shows Mr. Parsons in action, and was gotten up by him personally. The little pasters are everywhere, and one is produced here for the benefit of our readers." But it was his big ad in the PD, shown below, that has to win some sort of award for strangeness. ("Worst. Ad. Ever," as the Simpsons' character Comic Book Guy might say.) 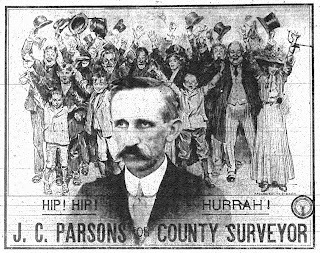 The unphotogenic Mr. Parsons lost by a landslide to the incumbent surveyor George H. Winkler, who promptly died. It was bad enough to lose after spending quite a pile of coin on the ads but as it was apparently known that Winkler had been quite ill for some time, it must have truly stung that the voters still preferred a nearly-dead candidate. The last peculiarity of 1910 concerns Doc Summerfield, the town's veterinarian. One evening after supper he pulled a bottle off the shelf and popped down a "digestive tablet." To his horror he realized that he had picked the wrong jar and had swallowed a mercury bichloride pill instead, "enough to kill several persons," according to the Santa Rosa Republican. Let us pause for a moment and contemplate what sort of idiot would keep identical bottles next to each other when one contained a terrible poison and the other had an old-fashioned version of Tums. Let's also wonder why he had mercury bichloride anyway, which was mainly used in tiny doses to treat syphilis, and ponder further if that meant he was still operating his side business - in 1908 he was mentioned as one of several upstanding Santa Rosans who was a landlord for a brothel on First street. Summerfield ran to Hahman's drug store downtown and was given an emetic plus some sort of antidote "hypodermic." There is no clear definition of what that might have been; medical literature published the following year stated colloidal silver seemed to work best, although the drawback was that large doses might turn the patient's skin a shade of metallic blue-grey known as Argyria. Three doctors rushed to the pharmacy to attend Dr. Summerfield but there was little they could do except observe (perhaps they all whipped out their pocket revolvers and were taking bets as to whose gun metal would soon match his complexion). By the following day the Doc was doing fine and presumably reorganizing the shelves in his office. A mistake that might have been fatal was made by Dr. J. J. Summerfield Friday evening just after he had eaten his supper. Only his presence of mind and promptness saved him from death. He took a tablet containing bichloride of mercury, thinking that it was some of his digestive tablets which he had been taking after each meal. It was about 8 o'clock when Dr. Summerfield went into the room which adjoins his stables and hospital on First street and in the dark he took down a bottle which he supposed contained his digestive tablets, and took one of them. As he returned the bottle to the shelf he noticed that he had gotten hold of the wrong bottle and that he had taken a mercury tablet, which contained about seven and a half grains of the poison, enough to kill several persons. He immediately ran to the Hahman drug store on Exchange avenue and there told them what he had done and asked for an emetic. Physicians were also called and it was not long before Doctors Cline, Bogle, and Bonar were at the doctor's side. Before Dr. Summerfield arrived at the Hahman drug store, a messenger more fleet of foot had preceded him and announced what had happened. Paul T. Hahman had an emetic ready and also gave him a hypodermic. This counteracted the effects of the poison, and later the physicians reached the patient. J. Walter Claypool and Dr. J. H. Rankin remained with Dr. Summerfield until long after midnight and he was resting easy at the time. On Saturday Dr. Summerfield was doing nicely, and all danger from the poison he had taken had entirely passed away. It was only the fact that the doctor knew what a deadly poison the stuff was and the promptness with which he went to the drug store for antidotes that he owes his life. Dr. Summerfield is also a very big, strong man and has a good constitution, which also helped him throw off the effects of the poison. I heard of a "patent medicine" party the other night. The idea was carried out not in the administering of medicines to the guests but in the adornment of the rooms with all sorts of advertisements. Prizes were awarded those who proved the most proficient in the guessing contest that located the advertisements with the medicine to which they belonged. It afforded much merriment. Mrs. John Turner of Bodega Bay created considerable excitement on the bay shore Saturday when she compelled Captain Hart, a pioneer of that section, to dance on the beach by firing shots at his feet and between his legs to emphasize her commands. The trouble is one of long standing. The Turners, husband and wife, reside on the country road, near Bodega Bay, while Captain Hart is a neighbor. They have had considerable trouble of various kinds at various times, so that when the Captain pulled a plank out of the water Saturday and left it on the beach and returned later discover that it had been thrown back into the water by his enemy, he could stand it no longer. According to the story which reached here Monday, the Captain, in addressing Mrs. Turner, used language far more expressive than polite and better fitted for use on sailing vessels than in polite society on land. When he had exhausted his vocabulary and stopped for breath, Mrs. Turner took a turn at telling the Captain what she thought of him, and then ordered him to dance. He at first demurred, but when the gun was brought into play he changed his mind, and as one shot followed another, he danced faster and faster, until finally a bullet hit him in the hip which ended the dance. Mrs. Turner was taken before Justice Cunninghame Monday, and after some discussion, she was allowed to go on parole until Wednesday, December 14, when the case will again be called in court. Meanwhile it is expected that Captain Hart will fully recover from his wound. HOW THE INSURANCE WARS WERE WON Much has already been written here about the earthquake insurance wars (introduction and wrap-up), but in brief: Immediately following the disaster, there was considerable anxiety as to how much and how soon the insurance companies would pay for losses. A few small insurers declared bankruptcy and did not pay at all, but most eventually offered settlement, although usually for less than the value insured. The worst case was the Connecticut Fire Insurance Company, which flatly refused to pay its handful of Santa Rosa customers because they said the earthquake voided the fire insurance policies. 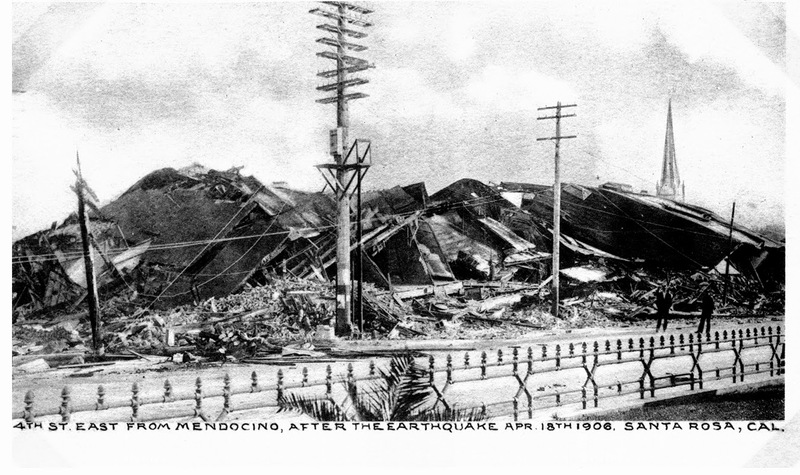 ...the Connecticut advertised broadcast that it was "one of the few companies that settled all losses growing out of the earthquake and fire of April 18, 1906." The facts being exactly to the contrary, several thousand circulars were sent out by the local Chamber of Commerce calling attention to the false claims being made by the Connecticut, and showing that of all the companies doing business here at the time of the fire the Connecticut was the only one that had failed to settle on some basis or another. These circulars were sent to nearly every important commercial organization in the United States. The 1910 Santa Rosa papers also printed the appellate court decisions against the insurance company, which revealed further bits of lost history. As explained in the series' introduction, the legal fight was over the "fallen-building" clause in the insurance policies: If the contents of the building were on fire before the structure collapsed, the insurance company had to pay up (the Santa Rosa policies were all coverage of store inventories, not the buildings). To win, the insurance company lawyers only had to convince a jury that any part of the building fell down before fire destroyed the goods. Given that eyewitnesses encountered a scene on Fourth street of such absolute destruction that they often could not identify particular buildings, it seems like the insurance company should have won every one of these suits with ease. But while it was always safe to presume some trial witnesses perjured themselves to help their fellow Santa Rosans triumph over the insurance company, the appellate decisions show serious mistakes were made in the conduct of the trial and the suits were ultimately won by the Santa Rosa shopkeepers via legal hairsplitting, not the merits of any evidence. The appeals court likewise showed bias towards the Santa Rosa plaintiffs. In the Moodey shoe store case, they refused the request for a new trial although they found the trial judge had completely misinformed the jury about the fallen-building clause. Superior Court Judge Denny told jurors it meant that "some functional portion of the building, the falling of which would destroy its distinctive character," and it didn't apply as long as more than three-fourths of the building was intact, even if the roof had collapsed along with the front falling away. All of these ifs, ands, or buts apparently tumbled out of the good judge's vivid imagination, but, hey, the appeals court ruled that didn't matter because the jury ended up deciding that no substantial parts of the building fell before the fire. Bias was even more obvious in the appeal for the Davis pharmacy case. The insurance company lawyer wanted a mistrial because there was an objection to asking Fire Chief Muther and J. D. Ward, material witnesses on the scene, "do you know whether it fell by fire or otherwise?" The appeal was denied - although the justices had to twist logic into a pretzel to provide reasons why. First, the Court of Appeals didn't like how that question was phrased: It implied Muther and Ward had "actual knowledge" of what happened. Since they weren't there when the building fell down, any answers would be merely opinion, which "could have added nothing to the probative force of their testimony." Note the point that their opinions didn't matter. The Court also disagreed with the insurance company's argument that "the very issue in the case" was whether the building fell down because of fire or earthquake. The cause of the structure's collapse, said the Court, didn't matter at all - unless it fell down before the stuff was burned. Thus "why" and "when" were disconnected into separate issues, unless perhaps they weren't. But even while the Appellate Court ruled opinions didn't matter and the sequence of events probably didn't matter, they wrote, "...from the facts to which the said witnesses testified only one inference could be drawn and that is that the earthquake virtually destroyed the building..." Ward had described that section of Fourth street as being "all a mass of debris tumbled down[,] I couldn't exactly distinguish where the Davis drug store was, but they all looked the same." Muther had also testified the earthquake had caused the damage to the drug store building. In other words, despite (non-opinionated) testimony that the building's collapse was caused by the earthquake before the fire started, it wasn't important that the jury ignored this key fact in deciding their verdict. Reading that decision, one gets the impression that the Appellate Court really enjoyed slapping the insurance company around (not that's necessarily a bad thing), making the point they lost the case despite having all evidence in their favor and the Davis lawyer making a stupid mistake. It was testified that Davis wanted to enter the wreckage to rescue his prescription book, but was prevented by two policemen who feared an aftershock could trap him in the debris. The trial should have ended at that moment; there could be no further debate as to the condition of the building before the fire. But Davis had died before the trial began, so the story was hearsay; the trial judge would have excluded it if the Davis lawyer was awake at the time and had objected. As the jury was apparently determined to ignore evidence in the insurance company's favor, this little anecdote had no bearing on the trial, and was not part of the appeal. The only reason for the Appellate Court to mention this at all was to simply rub the insurance company's nose in it. THE MAGNITUDE OF THE TRAGEDY Local history buffs still are heard to claim (boast, actually) that the 1906 earthquake had a relatively greater impact on Santa Rosa than San Francisco. That dubious honor is certainly not true and is based on skewed interpretations. The amount of property damage is routinely exaggerated; much of Santa Rosa's business district was flattened or burned but not all of it, and only a handful of homes were seriously damaged. By contrast to the fourteen commercial and municipal blocks here with buildings lost to fire or collapse, nearly 500 city blocks were destroyed in San Francisco and a quarter of a million people were left homeless. Finally in the 1910 census, a better picture emerges: There were 13,560 people in the entire Santa Rosa township that year with 42 percent of them living outside of city limits. It is fairer to use the overall township count when comparing the earthquake outcome because San Francisco included its entire footprint on the peninsula. Working backwards from those numbers, it would place the earthquake population in the high 11,000s, which is also the figure that emerges from estimates by the company that published the city directories (see FAQ). Bottom line: The best estimate we can probably ever make is that about 0.7 percent of the overall Santa Rosa population was killed in the 1906 earthquake, slightly less than half the percentage of fatalities in San Francisco. Washington, March 10--The population of Santa Rosa township, including Santa Rosa city, is 13,560, according to the thirteenth census. The population of Santa Rosa township outside of the city is 5,743. The population of the city by wards is...7,817. The population of Petaluma township, including Petaluma city, is 8,787. The population of Petaluma township outside of the city is 2,907. The population of the city by precincts is...5,880. The population of Santa Rosa is 10,851 as shown by the school census of 1910 just recently completed, based upon the estimate used by Job Wood, Jr., who is probably the leading expert of the state on school census figures and their relation to population. For fourteen years Wood has been connected with the office of State Superintendent of Public Instruction, being assigned to the census department. He has made a special study of the matter, and has arrived at his knowledge by comparing the school census with other computations of the population of the bay cities for many years. The last federal census and the various other computations such as the post office directories, city directories, school censuses, which included the whole population, etc., have all been used by him in determining the percentage. The school census as reported to County Superintendent of Schools DeWitt Montgomery by the Census Marshals, reached a total of 1,973, or 63 more than a year ago. Mr. Wood declares that the population averages five and a half persons per census child which makes a total for Court House School district of 10,851. The usual average of computation, taking the state as a whole has alway been five, which would make the total 8,865. Sacramento, March 3--In the case of O. Fountain vs. the Connecticut Fire Insurance Company the Third District Court of Appeal this morning affirmed the decision of the Superior Court of Sonoma county ordering the insurance company to pay Fountain for losses on merchandise in Santa Rosa caused by the earthquake and fire of 1906. The course pursued by the Connecticut Fire Insurance Company in regard to its Santa Rosa claims aroused much hostile criticism, and resulted in its being dubbed "the welching company," a name that it will be apt to retain for a long time. Immediately after the fire, Manager Smith curtly notified his Santa Rosa policyholders that he would not pay, and he stuck to it. Later, the Connecticut advertised broadcast that it was "one of the few companies that settled all losses growing out of the earthquake and fire of April 18, 1906." The facts being exactly to the contrary, several thousand circulars were sent out by the local Chamber of Commerce calling attention to the false claims being made by the Connecticut, and showing that of all the companies doing business here at the time of the fire the Connecticut was the only one that had failed to settle on some basis or another. These circulars were sent to nearly every important commercial organization in the United States.